DETROIT March 24, 2015– Hundreds of delegates will arrive at Cobo Center in Detroit today to strategize upcoming negotiations with automakers and other employers, and will include representatives from the public sector, education, agriculture, healthcare, as well as manufacturing. Today’s speakers will include Detroit Mayor Mike Duggan, NAACP President and CEO Cornell William Brooks and US Secretary of Labor Thomas Perez. Tomorrow will feature UAW President Dennis Williams, Sec-Treasurer Gary Casteel and Congressman John Lewis (D-Georgia). Some 900 delegates from more than 800 local unions in the U.S. will converge on Detroit Tuesday and Wednesday to hash out a collective bargaining program ahead of negotiations with the Detroit Three automakers and others this summer. Delegates will represent more than 1,500 employers in auto, aerospace, agriculture, health care, public service, education and other sectors. 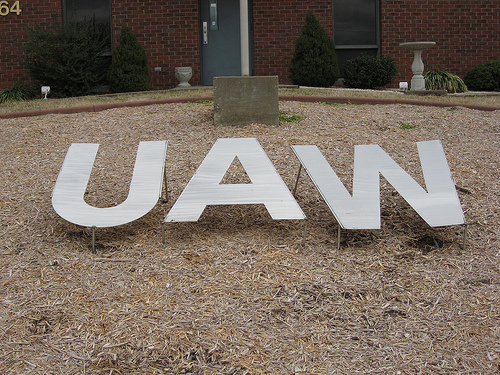 UAW contracts with the Detroit Three automakers expire in September. The negotiations, which occur every four years, begin this summer. In 2014, the auto industry supported 532,000 jobs in Michigan, more than any other state in the U.S., according to the Center for Automotive Research. This entry was posted on March 24, 2015 by WMALC in Michigan labor news and tagged Democrats, Detroit, healthcare, John Lewis, Mike Duggan, NAACP, UAW.